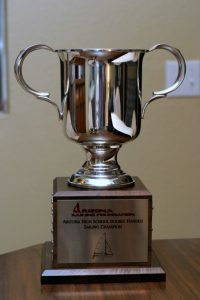 The Fourth Annual Arizona High School Sailing Championship is scheduled to be held on 21 April 2012 at Tempe Town Lake. Last year Alexia Lorch won and her crew was Scott Soethe. She is was junior at Xavier College Preparatory and Scott was a student at Brophy College Preparatory. A perpetual trophy to display at the school of the skipper for half the time until next years race (the other half of the time to be displayed at the school of the crew) was presented after the races. Individual trophies were presented for the winners to keep.